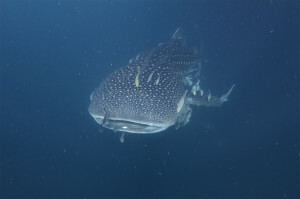 As divers, we’re all aware of the threat to shark populations from shark-fining, but do you know that endangered species such as basking sharks, whale sharks, and great whites are being processed for fish oil and other non-essentials such as lipstick, face cream, and other health supplements? The oil wouldn’t be called “shark liver oil” but rather “fish liver oil”. In addition, whale shark skins are sold to Chinese restaurants in Europe as fish skins or fish gelatin. This plant produced over 20 tons of oil from basking sharks, 100 tons of oil from blue sharks, and went through over 600 whale sharks last year…please spread the word as education and awareness will help stop the killing.